A few months ago, I took my younger cousin to her first book signing. 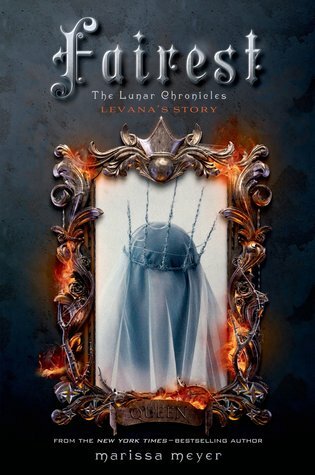 Marissa writes an amazing series called The Lunar Chronicles. She takes fairy tales and adds a sci-fi twist to them. They are AMAZING!! Fairest is a companion novel that tells the story of Queen Lavana (the villian of TLC). I’ve been borrowing this book from my cousin for a little over a month and I keep putting off reading it because I keep getting distracted by TV shows or video games. BUT NO MORE!!! I’m starting this book finally this week, and I am STOKED!!! I may get a lot of crap about this one, but oh well. I’ve been listening to this song a LOT. Last week I watched the entire series of Young and Hungry (it’s so silly but cute. I recommend it for those days you want something that doesn’t require a lot of investment) and Jesse McCartney plays a pretty important part in the series. It made me nostalgic for his music. Little did I know that he came out with something fairly recently. This song has been playing a lot on my playlist at work. A few weeks ago I saw Pitch Perfect 2 and while I haven’t bought the album yet, I have been listening to this song a lot. I feel that Pitch Perfect didn’t use Ester Dean to her full potential. She’s an amazing singer and I wish she could have sung a lot more. Did you know that ModCloth has an app? It’s glorious and dangerous. I spent a great deal of time this weekend looking through all the stuff on their site and <3 ing a bunch of them. I’m particularly in love with the stationary. I signed up a couple months ago for GeekGirlPenPals but got intimidated by it and so I’ve failed as a pen pal. Siiiiiigh. The thing is I love stationary, and have a whole lot of it. But have failed to be a good pen pal and actually use it. Maybe if I buy new stationary, I’ll be more inclined to write to pen pals. As my TV shows have ended, some of the web-series I love are gearing to come back. In anticipation for that I have been re-watching Classic Alice and The New Adventures of Peter and Wendy. Both are amazingly produced and acted series that I am completely engrossed in. What are some things you’ve been thrilled with? Got any recommendations for me?